SOM dedicates Grady faculty building: Grady Hospital’s newest addition—the Emory Clinical Training and Faculty Office Building—was dedicated on April 8. 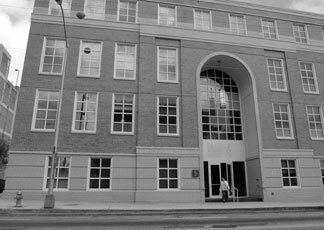 The four-story, 68,000-square-foot building, located across the street from Grady at the historic intersection of Armstrong Street and Jesse Hill Jr. Drive, provides much-needed faculty office space and will serve as the first real “home” for medical students at Grady. A first-floor display traces the evolution of Emory’s medical school since its founding in 1854 as the Atlanta Medical College. Photo by Ann Borden. 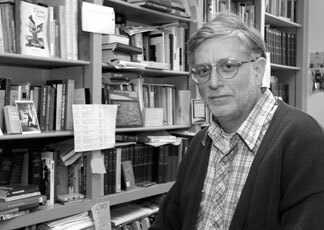 Goldman book explores Christian views of Jews: God’s Sacred Tongue: Hebrew & the American Imagination is a story of Christian-Jewish intellectual interaction in the United States from before the American Revolution to the 20th century. Shalom Goldman, associate professor of Hebrew and Middle Eastern studies, unfolds his narrative with portraits of Christian thinkers who studied Judaism. Photo by Jon Rou.